Admittedly, it was a bold plan. 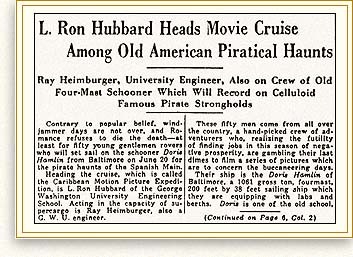 Ron himself described it as audacious, and spoke of a dozen troublesome detailsfrom the leasing of 35 mm cameras for that newsreel footage to the purchasing of stores. (Among other mishaps, Ron would tell of an enthusiastic but hapless undergraduate purchasing a thousand cases of tomato catsup instead of the thousand called-for tomatoes, while another blew out the water tanks after plugging the vent holes.) Then there was the vessel itselfthe 205-foot Doris Hamlin, still stinking from her previous cargo of livestock and vaguely known in nautical circles for having been blown farther off course than any ship in recorded history. Finally, there was the last minute illness of fellow adventurer and expedition co-director Philip Browning, leaving Ron without his cinematographic equipment and otherwise shouldering the burden alone. The first leagues were equally trying with sail-shredding winds off Chesapeake Bay, and serious leaks in the water tanks. Then followed difficulties with the native cook, necessitating an LRH hand in the galley, while the dour Captain Garfield proved himself far less than the advertised Captain Courageous, further necessitating an LRH hand at both the helm and charts where his notations would ultimately augment coast pilots of the Lesser Antilles. Finally, in a telltale letter from Bermuda, where eleven of the party called it quits, came LRH references to tainted beef, contrary tides and financial resources as frail and frayed as the Hamlins sails. It never rains but it pours, Ron quipped from Puerto Rico and told of unexpected towage costs and harbor fees. 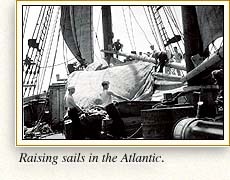 Then, too, Garfield had shredded both the foresail and flying jib, which effectively ended the Hamlins voyage and left her with a bundle of rags for sails. Yet in what amounted to a closing note, Ron also told of fishing for barracuda in the Sargasso Sea, plowing an exquisite Vieques Sound for coral specimens, and, most significantly, ascending to the fiery mouth of Mount Pelée for a very rare photographic vista. 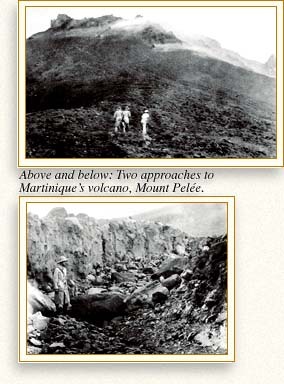 I was down in Martinique, that sullen black island, and I wanted a glimpse of the savage volcano Pelée which today, is a smoldering, angry peak overshadowing the calm blue Caribbean. Occasionally it spews forth molten, boiling rock and tries again to repeat itself. It is half alive, but there is never any knowing when it will explode again. I was very interested in Pelée and I went to Saint Pierre one afternoon to climb it. No one told me that it was farther than it looked and that darkness would catch hold of me. And that lava rolled down the slopes. From sheer ignorance, I started up. It was almost dark when I reached the top. My shoes were burned black, I had laid my socks on a rock to dry and the rock had burned them completely up. I was drenched by sudden rains and half-suffocated with fumes. It was dark when I started down. Pelée decided to have some fun with me. 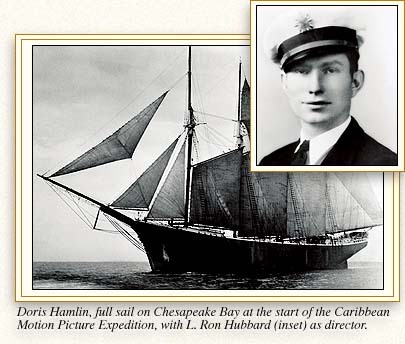 As for what else might be said about this Caribbean Motion Picture Expedition, those photographs from Mount Pelée were eventually purchased by the New York Times, those Vieques Sound coral specimens were finally acquired by the National Museum, and even some fifty years later, those who sailed with L. Ron Hubbard in 1932, would still speak of that voyage as the one grand adventure in the twilight of their youth.